Bigtoolrack Launches New Product for the ATV & Tractor Market! The Bigtoolrack XP & ATV Sport Rack by Bigtoolrack was designed for many outdoor applications, including fall clean-up, camping, hunting, ATV, and a variety of outdoor sports. Get more out of your tractor by investing in this practical and affordable tractor tool rack. Bigtoolrack®, the home of the ultimate attachment for trailers and other landscaping equipment, is pleased to announce the launch of a brand new product that will help landscapers and outdoor enthusiasts get around better and complete their jobs more efficiently. The Bigtoolrack XP is a multifunctional rack that can attach to a wide variety of off-road vehicles, mowers, and tractors, serving a number of different applications. The new rack features a roto molded plastic body and power-coated metal upright for the ultimate in durability. It also contains the same great attaching parts as the original Bigtoolrack. The XP attaches using any standard 1 ¼ inch receiver or 2 inch receiver as well an optional 3 point hitch connector, making it the most secure tractor tool rack on the market today. It is great for recreational campers, hunters or enthusiasts of any outdoor sports that require the ability to carry cargo on your ATV or tractor. "With the Bigtoolrack XP, the uses are literally endless. Get more out of your tractor by investing in this practical and affordable tractor tool rack," said Timothy Descoteaux, Founder of Bigtoolrack. 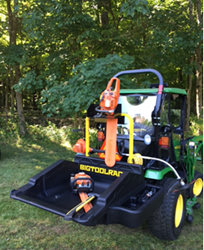 Bigtoolrack is a revolutionary tractor attachment, enabling landscapers, contractors, and others to carry their tools all around the job and make better use of their trailers. Learn more about the Bigtoolrack today by visiting http://www.bigtoolrack.com.